To mark the 80th anniversary of the start of the Spanish Civil War LALKAR is pleased to reproduce the following article by Gary Jones, with thanks. In the autumn of 1937, Zhang Ruishu was enjoying a rare break from his 14-hour days on the frontline. One of very few, if not the only, Chinese in Madrid, he hadn’t asked for time off – there was so much to do – but his commander had insisted he take a break. The Spanish capital was decorated with defiant if raggedy banners reading No pasarán (“They shall not pass”) and Madrid será la tumba del fascismo (“Madrid will be the tomb of fascism”). Zhang had seen many such signs before. At a newsstand, however, a large promotional poster for Spanish news magazine Estampa caught his eye. The intriguing poster featured a man’s face in profile. It wasn’t a handsome face, but ruddy and weathered, with tightly cropped hair, hollow cheeks and a muddle of crooked teeth in a mouth set slightly agape – the face of a no-nonsense man who had known hardship. Suddenly, a crowd was gathering around Zhang; eyes were widening and fingers pointing. “That’s him!” they cried, lunging forward to shake the stranger’s hand. Almost 20 years to the day since he had first set foot on European soil, the humble 44-year-old from Shandong province, now a medic with Republican forces fighting fascism in the Spanish civil war, was being hailed as a hero in a country almost 10,000km from home. 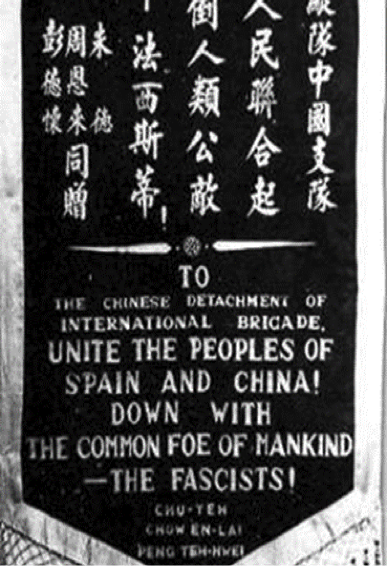 Just over a year earlier, on July 17, 1936, at the same time as militaristic Japan was becoming increasingly assertive in China, a group of right-wing officers in the Spanish Army, led by General Francisco Franco, rose against the democratically elected Republican government. The move marked the beginning of a civil war that was to last for two years and eight months and provide a prelude to an even greater conflict in Europe. While Franco’s Nationalists were openly assisted by the German and Italian forces of fascist dictators Adolf Hitler and Benito Mussolini, democratic nations including France and Britain operated an official policy of non-intervention, to the disgust of many of their own people, who saw the struggle as a fight against the evils of fascism and a prelude to even greater conflict in Europe. In response to their governments’ indifference, tens of thousands of workers, trade unionists and left-wing students mobilised and headed to Spain, to take up arms. The number of overseas combatants who fought in what came to be known as the International Brigades has been estimated at 40,000, with volunteers flooding in from 53 countries, including France (9,000 people), the United States (2,800), Britain (2,500), Poland (3,000) and even Germany (4,000) and Italy (3,000). They came from Costa Rica and Albania, from Greece, Cuba and Argentina, from Finland, Ireland, South Africa and Bulgaria. And they came from China. A multi-decade investigation by Len and Hwei-Ru Tsou, two American-Taiwanese research scientists (now retired and living in San Jose, California), has shown that more than 100 Chinese fought shoulder-to-shoulder with the Republicans. Some of their stories are detailed in the couple’s book,	The Call of Spain: The Chinese Volunteers in the Spanish Civil War (1936-1939), which was first published in traditional Chinese in Taiwan in 2001 (and extended in 2015), and in Spanish and simplified Chinese in 2013, with new material to be added as it comes to light. The Tsous’ call to arms was a documentary film made in the US. That year was the 50th anniversary of the war’s commencement, and Abraham Lincoln Brigade veterans published a brochure to mark the occasion. It contained a complete roster of the volunteers. A seed had been sown, and the couple dug deeper. With many war veterans growing old, the researchers had to move fast, travelling many times to Spain, China, France, the Netherlands, Bulgaria, Germany and other countries to interview ex-soldiers, former volunteers, relatives and friends, and sifting through reams of official documents. They discovered that the Chinese had come from all backgrounds, some from civil-servant families, others had been the lowliest of manual labourers and illiterate farmers. As their numbers had been relatively small, there had been no official Chinese brigade in Spain, and they fought in battalions from other nations, usually chosen depending on their language skills. While Franco’s Nationalists had might on their side, the Republicans were not completely alone: they received material aid and more than 2,000 combat troops from the Soviet Union. Mao Zedong sent an open letter of support to the Republicans in May 1937. What Mao perhaps did not know was that, by then, a number of Chinese were already there. Zhang’s road to Europe began as early as 1917, when – at the height of the first world war – Britain and France recruited more than 100,000 Chinese to labour in factories whose regular workforces were now fighting at the front. Born into extreme poverty in 1893, Zhang – orphaned since a teenager, jobless, illiterate and desperate – signed up, boarding a ship packed with almost 2,000 other Chinese men bound for Marseilles. After a gruelling 70 days at sea, Zhang was put to work in a French paper mill. In less than a year, however, Germany had surrendered, the war ended and the Chinese workers were surplus to French requirements. The majority were shipped home. With no family and no prospects back in China, Zhang decided to stay and try his luck, taking on the unpleasant and dangerous jobs (disinterring corpses and detonating unexploded gas bombs, for instance) that the French avoided. Also hailing from Shandong, stout and plucky Liu Jingtian was born in 1890. After a stint in the Chinese army he too journeyed to France in 1917, remained when the war ended and, in 1924, he and Zhang (increasingly an auto­didact now teaching himself French) secured steady employment at the Renault car-manufacturing plant in the western Paris suburb of Boulogne-Billancourt. Like many industrial workers at the time, they joined the French Communist Party and, when the Spanish civil war broke out, they were called upon to down tools, cross the Pyrenees on foot and slug it out with fascism. Zhang and Liu arrived in Spain in November 1936, and though they asked to become International Brigade machine-gunners, their ages (both were in their 40s) saw them assigned to medical teams as stretcher-bearers, frequently charged with rescuing wounded soldiers while under fire. As described in	Estampa, Zhang was wounded in the chest, shoulders and hands while discharging his duties. A dramatic, heat-of-battle photograph depicting Liu rescuing a wounded soldier was published in Spanish newspaper Frente Rojo, and he was lauded in print for his heroism. Fighting with the Abraham Lincoln Brigade, Zhang Ji from Minnesota and Chen Wenrao from New York were also originally from China. Chen, born in Guangdong province, was killed at the bloody Battle of Gandesa, in 1938, aged 25. Zhang, however, survived the war in Spain. Coming from an educated family of relative privilege in Hunan province, Zhang Ji had left China for San Francisco in 1918, receiving a degree in mining engineering from the University of Minnesota in 1923. After the financial crash of 1929, he lost his job as an engineer and became radicalised, joining the Communist Party of the United States in 1935. In March 1937 – aged 37 – Zhang Ji boarded the SS Paris ocean liner in New York and headed for France, then crossed the Pyrenees into Spain. Tall, slim and ungainly, and not the physically strongest of volunteers, Zhang Ji was initially assigned as a truck driver, before taking desk duties. Described in The Call of Spain as quiet and mysterious, Chinese-Indonesian doctor Bi Daowen (who also went by the Indonesian name Tio Oen Bik) of Java was 31 when he arrived in Spain, in September 1937, while one of the most fervently political of the Chinese was slight, bespectacled Xie Weijin, who was born in Sichuan province in 1899. Xie participated in the anti-imperialist May Fourth Movement in Shanghai in 1919 before heading for France. In the 1920s, he joined the Communist Youth League in Europe and the Communist Party of China’s European Branch, and a photo taken at a meeting in Berlin in 1927 shows Xie handing over a banner reading “from the strike workers of Hong Kong and Kowloon” to the German communist leader Ernst Thälmann, who would be shot on Hitler’s orders in Buchenwald concentration camp in 1944. Xie was made a machine-gunner with the Austrian battalion but was removed from the frontline after being shot through his right leg, below the knee. According to the Tsous’ research, Chen Agen was possibly the only Chinese volunteer who came to the war directly from China. Chen was, in fact, fleeing the authorities, having organised a trade union in Shanghai. While heading for Europe in 1937, a Vietnamese cook – rumoured to have been Ho Chi Minh – regaled Chen with tales of the anti-fascist derring-do in Spain, so he travelled there to fight, only to be captured and put to labour as a prisoner of war. With an arms embargo in place, according to the non-intervention policy of many countries, by 1938 the Republicans were in retreat, and in October the leadership ordered the withdrawal of the International Brigades in the hope of convincing the Nationalists’ foreign backers to withdraw their troops, but to no avail, and the war officially ended on April 1, 1939, with a Nationalist victory. The eventual fates of the International Brigade volunteers were as varied as their backgrounds. Chen was not freed from jail until 1942, and his trail quickly went cold in Madrid. 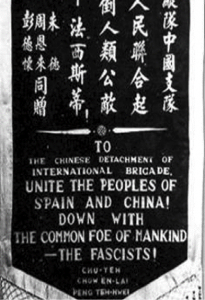 Zhang Ji fled Spain after the disbandment of the International Brigades and made it to Hong Kong, where in March 1939 his experiences of the Spanish civil war were published as “Spanish Vignettes” in the	T’ien Hsia Monthly. Chang had written of his wish to join Mao’s Eighth Route Army when he got back to China, but it is unknown whether he succeeded – the Tsous have found no record of his whereabouts after Hong Kong. Bi did make it to China and by 1940 he was in Yanan with Mao’s troops. Bi was one of the foreign volunteers who came to be revered as the “Spanish doctors”, supporting the Chinese war effort against Japan. The doctors had arrived in China from Poland, Germany, Canada, Britain, India and many other countries and had served on Spanish battlefields. Bi remained in Yanan until 1945 and the Japanese surrender, later working in the Soviet Union before returning to Indonesia, where he was ostracised for his revolutionary deeds and political beliefs. He was not heard from after 1966, one year after Suharto’s military coup, and Bi may have been executed. In early 1939, Xie was one of hundreds of thousands of Republican refugees who fled to France, where he was confined in the notorious Gurs internment camp for eight months before returning to China via Singapore, Hong Kong and Vietnam. Xie fought with the Red Army against the Japanese, eventually working as an engineer with the Chinese air force in the 1950s and early 60s. In 1965, however, Xie was purged from the Communist Party and labelled a revisionist due to his involvement with foreigners in Europe. He died of cancer in 1978, never having been rehabilitated. Liu arrived in Yanan at the end of 1939 and was admitted to the Communist Party in 1946. It is known that he worked on construction projects, including the	yaodong cave dwellings for which Yanan is famous, but then his trail went cold. And the Estampa poster boy? According to the Tsous, when the international volunteers retreated in 1938, Zhang Ruishu returned to Paris and was promptly arrested by the French government. Eventually released with help of the French Communist Party, his former co-workers and trade unionists at Renault paid for his passage by ship to China in 1939. After 1949, he worked in various administrative positions for the Xinhua News Agency, retiring in 1958. Ten years later, lonely and forgotten, he fell at the gate of his house, and died that same year, at the age of 75. For Hwei-Ru Tsou, the experiences of the Chinese volunteers, who fought – and in some cases died – for their internationalist beliefs on the other side of the planet from their homeland, are not just mere history, but shining examples in a world regularly buffeted by political storms and growing intolerance. “Their stories – in the current times – are so important,” She says. “The situation back then, with Hitler and Mussolini rising up in Europe, the economic and political situation at that time – that could return, and we see signs of that in some places in the world.